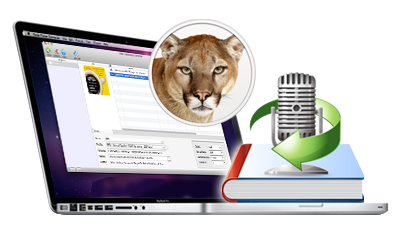 Ondesoft AudioBook Converter is specially designed for Mac users to batch convert Audible .AA audiobooks to MP3, AAC, AC3, AIFF, AU, FLAC, M4A, M4R and MKA with high quality. So you can play your purchased Audible audio book anywhere you want and share your favorite Audible audiobooks with others. • Convert DRM protected Audible .AA audio books to 9 popular audio formats. • Convert iTunes or Audible. AA audio books to mp3, aac and more in 16X speed. • Save Audible audiobook ID tags and metadata to the converted MP3, M4A files. • Chapter markings of Audible .AA audiobooks will be preserved to the M4A files. Want to import audiobooks purchased from iTunes store or Audible to your portable MP3 players? 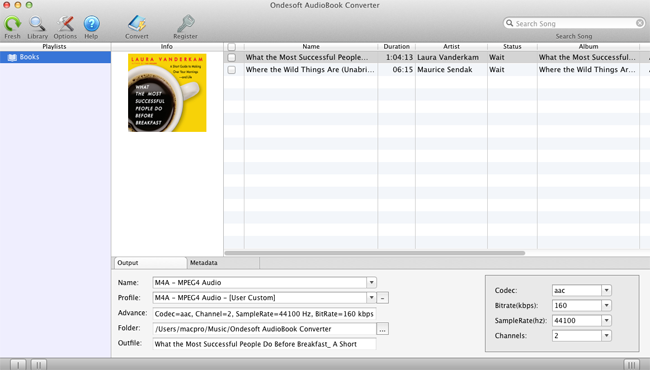 This is possible with Ondesoft AudioBook Converter for Mac. With 16X conversion speed, original quality and ID tags preserved, Ondesoft AudioBook Converter brings you another way to enjoy your Audible audio books, that is Audible audio books are no longer DRM protected and you can use it anywhere you want: share with your friends; set as background music; listen on your MP3 players. 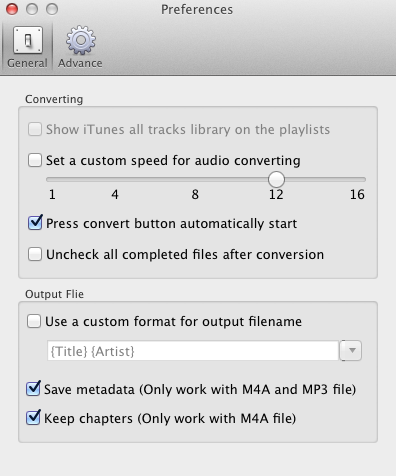 How to convert .AA, M4B, M4A audio books to MP3 with Audible AudioBook Converter for Mac? STEP 1: Free download Audible AudioBook Converter on your Mac, install and run it. All audiobooks on your iTunes Library of Audio Book are listed here. You only need to select or search audiobooks you want to convert instead of importing them manually. Batch conversion is supported. Tips: Audible AudioBook Converter for Mac only automatically obtains audiobooks from iTunes; so you should add audiobooks to iTunes first, and then click the "Fresh" button. 1. 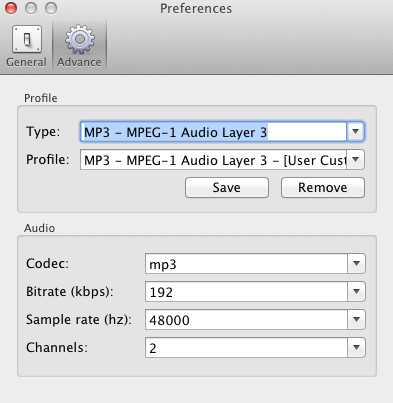 Customize the output settings including format, profile, output folder, filename and ID tags (for MP3 and M4A files only). 2. Click "Options" button to show up the Preferences panel, where you can change the conversion speed - from 1X to 16X; set filename format; choose to save metadata and other options in the General window, or configure a new profile and save it in the Advance window. 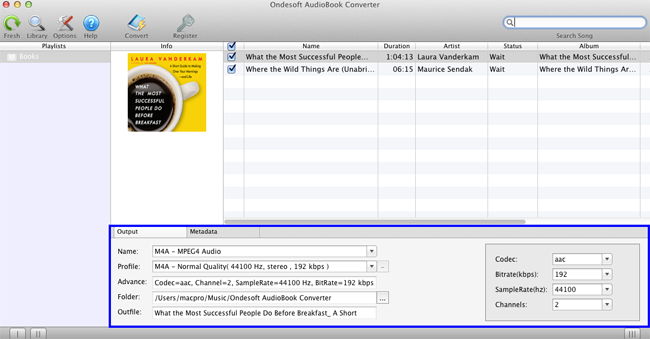 When finish all these settings, press "Convert" button to convert selected Audible audiobooks to MP3. After conversion, go to the folder and find the DRM-removed MP3 audiobooks. If you want to convert Audible audio books to MP3 to play on your MP3 players, Ondesoft AudioBook Converter for Mac is your perfect choice. Ondesoft AudioBook Converter is really a powerful converting tool, now I can enjoy my audio books on PSP, thanks! I am an audiobook lover and I have used Ondesoft AudioBook Converter for a couple of days. It is really stable and fast. I love it!